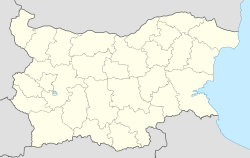 Dramsha or Drumsha (Bulgarian: Дръмша) is a village in Kostinbrod Municipality, Sofia Province Bulgaria. The legend goes that during Ottoman times, the invading Turks couldn't reach the village due to bad weather and non-existent roads. Therefore they called it Drumsha which means "Bad road" in rough translation. Until the late 90s it was lively place often visited by many people coming from Sofia for the summer due to the village's proximity to the capital. However, more recently the population has decreased significantly and Drumsha is somehow less preferred destination. As a result some establishments like restaurant and department store were closed and nowadays most people depend on either home-produced basic goods or import them from Sofia or nearby town of Kostinbrod. Nature is well preserved in and around Drumsha, mainly due to the lesser impact of humans. However, the village - and the region as a whole - suffer from a lack of water. Soil is generally very dry and not fertile. Livestock is common among local population and it is usual for almost every household to have goats, cows, horses, pigs, etc. This page was last edited on 13 September 2017, at 22:16 (UTC).